On the farther side of the stream three women were kneeling by William Hatherell. Harper's New Monthly Magazine, Vol. XC (December 1894), page 2. 21 cm wide by 12.3 cm high. Scanned image, caption, and commentary by Philip V. Allingham. Reproduced courtesy of Dorset County Council Library Service. This illustration for Thomas Hardy's The Simpletons later republished in book form when it appeared a new title, Jude the Obscure. In order to assist the reader in remembering the chief event of the first instalment when, in January, that reader would have to continue with the second instalment, Hatherell has created an aide memoire: the initial meeting of Arabella Donn and Jude Fawley. Although Hardy's text "itself does not have the moments of high drama that Hardy wrote into his earlier works" (Jackson 118), the meeting of Jude and Arabella is certainly the most important incident in the first instalment. Since this scene occurs in the last of the chapters in instalment one, the reader must wait some time for the realisation of the plate opposite the opening page of text. The illustration's lightness and charm are somewhat deceptive, for Jude is not the child that the plate implies, at least, he is physically already grown up (having passed his eighteenth birthday) when he meets Arabella on the outskirts of her father's pig farm. The general layout of farmyard and outbuildings in the picture were probably suggested to the artist by the passage in the next episode in which Jude returns: "descending by the path across the wide vacant hollow of corn-ground which lay between the village and the isolated house of Arabella in the dip[ beyond the upland" (Ch. VII). He is so absorbed in his own thoughts of future greatness as a scholar and an Anglican clergyman that he momentarily does not hear Arabella's remarking "Hoity-toity!" She has thus challenged him to come out of his reverie twice from the other side of the hedge before he notices Sarah (not actually named until Ch. VII), Anny, and Arabella and their pails on the other side of the stream. Hatherell's girls might as easily be washing clothing as pigs' intestines. Arabella literally slaps him out of daydreams of clerical triumph and academic achievement, for she hits him on the ear (recalling, perhaps, how Swift's Projectors on the flying island in Book Three of Gulliver's Travel's had to be physically recalled to reality) with a projectile particularly appropriate to her world-view and interests: the pizzle of a recently slaughtered pig (bowdlerized in the serial text). The rustic innocence of Hatherell's illustration reflects such censorship, for his maids are hardly the "coarse" animals Hardy describes. Although Hardy describes their leader, Arabella Donn, in vivid detail, emphasizing her form and complexion, the artist has had to search his own imagination for the girls' clothing and the backdrop. 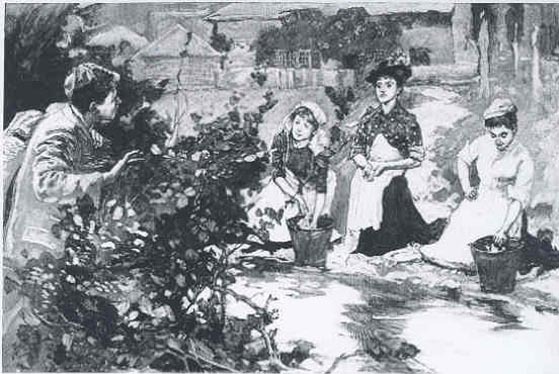 Arabella, "a fine dark-eyed girl," is distinguished from her companions in Hatherell's plate by her dark hat (the others wear linen caps) and upright posture, as well as by her blouse, whose pattern reflects the variegated light and dark leaves of the bush which Jude is parting to get a better view. The plank which in the letter-press connects the two banks further up the stream is not visible, nor is Jude's work-basket clearly depicted as the object draped over his left shoulder. For this illustration, depicting the first moments of Jude's sexual awakening, the reader has had to wait until almost the close of the first instalment. The artist has placed the viewer on Jude's side of the stream , as in the text, in order to see more or less what Jude sees. Neither Hardy's protagonist nor his reader is aware as yet that this forthright young woman constitutes the counter-force to Jude's "magnificent Christminster dream" that he has pursued so assiduously throughout the previous chapters since the departure of schoolmaster Phillotson in the opening pages. Hardy, Thomas. Jude the Obscure, ed. Dennis Taylor. Harmondsworth: Penguin, 1998. Hatherell, William. Illustrations to Thomas Hardy's The Simpletons, afterwards Hearts Insurgent. Harper's New Monthly Magazine from December 1894 through November 1895. Volume XC: pages 2, 203, 365, 566, 737, and 956. Volume XCI: pages 118, 252, 410, 572, 754, and 896. Jackson, Arlene. Illustration and the Novels of Thomas Hardy. Totowa, New Jersey: Rowman and Littlefield, 1981.